Azure vs AWS: Which platform to choose for Big Data & Analytics solutions? In an increasingly data-driven business atmosphere, Enterprises are strategizing more towards deriving meaningful insights from their vast amounts of data. As per Gartner, till 2017, 75% Enterprises have already invested in technology that facilitates Data Analysis. Amongst the many cloud vendors available, Microsoft Azure and Amazon AWS are the top Cloud Platforms that Enterprises are utilizing to build their robust Big Data & Analytics solutions. Here is a snapshot that helps better understand the salient features of Azure and AWS platforms available to build Big Data and Analytics solutions. Big Data & Analytics relies heavily on computing power because of the vast amounts of data that needs to be analyzed. AWS provides EC2 instances for computing along with ancillary services like Elastic Beanstalk and EC2 container services. Whereas, Azure’s compute mostly comes from its Virtual Machines. Both offer scale-on-demand computing capacity, providing the infrastructure needed to run robust Big Data & Analytics solutions. Network and Storage act as the backbone for Big Data solutions, pertaining to which, both the platforms support relational databases and are excellent with networking attributes. AWS & Azure offer scalable storage features like S3 and Azure Blob Storage respectively to handle unstructured data and are at par with each other. An American Manufacturing Leader goes cutting-edge with AWS IoT for smart data management and analytics capabilities. The robust & scalable Industrial IoT platform helps in remote monitoring of connected devices and managing millions of data records per day, enabling real-time visibility of measurement & control data. Read the customer success story. The pricing factor is a key to choose a capable Cloud Analytics platform and AWS & Azure both offer competitive pricing. AWS charges an upfront fee depending on the use or offers a committed instance for up to three years. Further, clients can bid for any extra bandwidth, if available. Azure has a pay-as-you-go model with Microsoft charging its customers by the minute. For a shorter commitment, Microsoft may allow a mix of pre-paid and monthly charges. 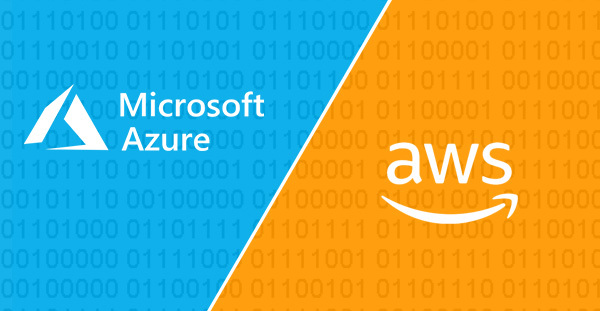 Considering the vulnerability of data theft and leakage, AWS & Azure both provide greatest security features to safeguard hacking instances and sensitive data. With 90% of Fortune 500 companies entrusting Azure for their Big Data & Analytics security aspect, Azure is emerging victorious for Enterprise security. Most organizations demand to access their business-critical data reports anytime and anywhere. AWS & Azure comply to this need by facilitating excellent reporting and business intelligence tools with QuickSight and Power BI respectively. Microsoft’s Power BI is ranked higher because it can extract and combine data from more than fifty sources, along with a massive visual library and data formatting features. A UK's leading Food Service specialist utilizes Microsoft Power BI to run its entire supply chain operations efficiently. It has created a self-sufficient Business Intelligence environment that empowers its operations team, mobile workforce, and food-delivery personnel with information essential for intelligent decision-making. Thereby, gains supply chain operations insights and improved operational efficiency. Read the customer success story. The biggest challenge for processing a large amount of data is latency and cost. While AWS has ‘Kinesis’, Azure houses ‘Event Hubs,’ both displaying enough firepower for data analysis inexpensively and in situations with low latency. Finally, a future-ready Enterprise is dependent on the promise from Cloud Partners for predictive Data Analytics capabilities using Machine Learning. Acknowledging the criticality, Azure & AWS have rolled out simplistic Machine Learning abilities on their Cloud Platforms. AWS is a market leader with 40% of market capitalization in 2017. Its vast list of features makes it lucrative for larger corporations whereas a growing infrastructure promises scalability and price cuts for upstarts. While Azure will win in areas wherein organizations are heavily invested in Microsoft for its non-Azure technologies. Choosing the correct Cloud Platform is solely dependent on the structure and need of an enterprise. It is critical to have a capable Data Analytics partner to help navigate an enterprise to choose the right cloud platform for Big Data & Analytics solutions, in order to fully leverage data capabilities.